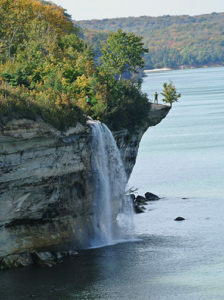 In one of the most spectacular regions of the state, Pictured Rocks National Lakeshore, you have one of the most spectacular paths to hike and MichiganTrailMaps.com’s newest map, the Lakeshore Trail. on Lake Superior and 200 feet above it. And except for a five-mile stretch from the Grand Sable Visitor Center, the eastern trailhead, you're almost never out of sight of the largest Great Lake of them all. The scenery is so amazing and at times so exhilarating that the Lakeshore Trail is often considered the crowning jewel of the NCT’s 4,600 miles. The park’s 13 backcountry campgrounds are scattered along the trail at 2 to 5-mile intervals and overlook Lake Superior. These 84 walk-in sites, the only places backcountry camping is allowed, are also used by sea kayakers and can be reserved in advance. 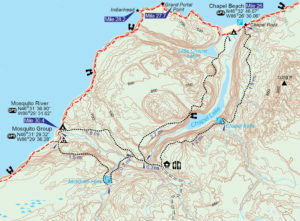 MichiganTrailMaps.com, your trusted companion for trail information. The large format map measures 11 by 17 inches, is printed on durable card stock and coated to be water resistant. Includes all distance markers, contour lines, historic buildings and ruins. Best of all, when folded it fits in your back pocket or the side pouch of your pack.